We have been working on this flavor combination for a while, and had a hard time finding a cookie to complement the intense flavor of the chili in just the right way. After stumbling across this recipe at divine-baking.com a while back, we thought with a couple of adjustments it would be just right – and boy did we hit the nail on the head! Crispy on the outside, gooey on the inside they start with an intense chocolate flavor and finish with a spicy tingle, that cuts the richness of the dark chocolate and leaves you wanting more! An added plus; these cookies are gluten free and contain no butter or oil. Preheat oven to 350°F. Spray 2 large baking sheets with nonstick spray, or prepare with parchment paper. Melt 1 cup bittersweet chocolate in double boiler, set aside and allow to cool. Using an electric mixer, beat egg whites in a large bowl until soft peaks form. Gradually beat in 1 cup powdered sugar. Continue beating until mixture resembles soft marshmallow creme. 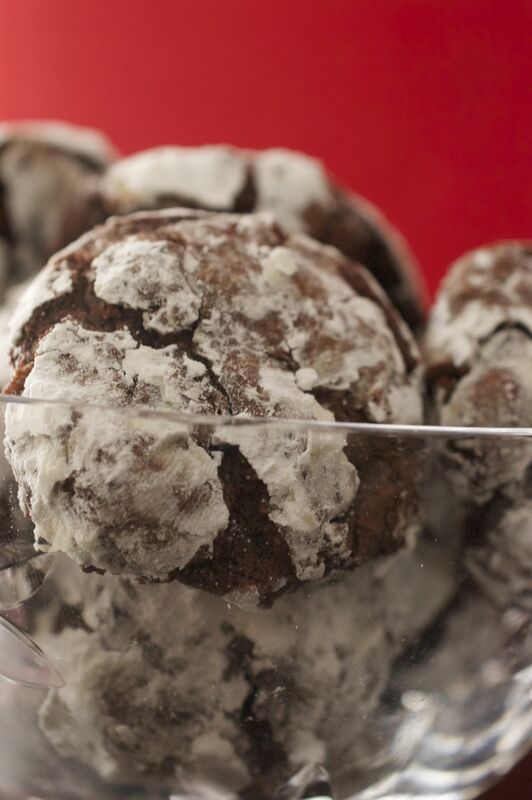 In a medium bowl, whisk together 1 cup powdered sugar, cocoa, cornstarch, cayenne pepper, and salt. On low speed, beat dry ingredients into meringue. Stir in lukewarm chocolate and ½ cup dark chocolate chips. Roll 1 rounded tablespoon of dough into a ball; roll in powdered sugar, coating thickly. Place on prepared sheet. Repeat with remaining dough, spacing 2 inches apart. Bake at 350°F until puffed and tops crack, about 10 minutes. Cool on cookie sheets for 5-10 minutes before transferring to wire rack to finish cooling. Good for a couple of days after baking.